There have been warnings against consuming raw or lightly cooked eggs on the grounds that the egg may be contaminated with Salmonella, a bacteria responsible for a type of food poisoning. With eggs and all other raw foods from animals, there is a small possibility of Salmonella food poisoning. The risk is greater for those who are pregnant, elderly or very young and those with medical problems which have impaired their immune systems. These individuals should avoid raw and under cooked animal foods. Healthy people need to remember that there is a very small risk and treat eggs and other raw animal foods accordingly. Use only properly refrigerated, clean, sound-shelled, fresh, grade AA or A eggs. Avoid mixing yolks and whites with the shell. Refrigerate broken-out eggs, prepared egg dishes and other foods if you will not be consuming them within an hour. For summer outings, use ice or coolant in an insulated bag or cooler to keep cold foods cold (40 F. or lower) and thermal containers to keep hot foods hot (140 F. or higher). When toting raw eggs on outings, leave them in their shells. Immediately consume, refrigerate or freeze raw or lightly cooked egg dishes. Eggnog and homemade ice cream should be based on a cooked stirred custard to ensure safety. The kitchen, too, can be a source of bacteria. Clean hands and equipment, sanitary food handling practices, proper cooking and adequate refrigeration are essential in safely preparing all foods. For further safety, combine the whites with the sugar in the recipe (using a minimum of 2 tablespoons of sugar per white) and beat over hot water or over low heat in a heavy saucepan until the whites stand in soft peaks. Without sugar, the whites will coagulate too rapidly and produce an unsatisfactory meringue. This is the same procedure used in making 7-minute Frosting and can be used to make Royal Icing or other frostings ordinarily containing raw whites. If using an unlined aluminum saucepan, do not add cream of tartar. It will react with the aluminum to produce and unattractive gray product. Raw egg yolks are a fine growth medium for bacteria. It is best to cook yolks for use in such dishes as cold souffle, chiffons, mousses, mayonnaise and Hollandaise sauce. To cook yolks, the recipe must contain at least 2 tablespoons of liquid per yolk. Less liquid will produce scrambled eggs. Simply combine the yolks with the liquid in the recipe. Cook in a heavy saucepan over a very low heat, stirring constantly, until the mixture coats a metal spoon, bubbles at the edges or reaches 160 F. Cool quickly and proceed with the recipe. One of several types of bacteria which can cause food poisoning (salmonellosis) if ingested in large numbers. It is found in the intestinal tract of animals, birds, insects, reptiles, seafood, and people. The bacteria can easily be passed from the intestinal tract to the hands and onto food. Although the inside of the egg was once considered almost sterile, Salmonella enteritidis (Se) has been found recently inside a small number of eggs (much less than 1%). If an egg does contain Se, the numbers in a freshly laid egg probably will be small and, if the eggs are properly refrigerated, will not multiply enough to cause illness in a healthy person. The majority of salmonellosis outbreaks have been attributed to foods other than eggs—chicken, beef, and fish—to human carriers, and through them, utensils and other foods during preparation. Of the outbreaks involving eggs, almost all have occurred in the food service sector and have been the result of inadequate refrigeration and insufficient cooking. Se will not grow at temperatures below 40 F. and is killed at 160 F., known as the danger zone, are ideal for rapid growth. Illness from Se can be avoided through adequate refrigeration, proper cooking and sanitary kitchen and food handling procedures. What will happen if I eat an egg containing Salmonella? If an egg containing Salmonella has been kept refrigerated and someone who uses good hygiene practices serves it to you immediately after proper cooking, you will simply have a nutritious meal. If the egg has been improperly handled, though, you might experience the food borne illness called salmonellosis. You could have symptoms of abdominal cramps, diarrhea, nausea, vomiting, chills, fever and/or headache within 6 to 72 hours after eating. The symptoms usually last only a day or two in healthy people but can lead to serious complications for the very young, pregnant women, the elderly, the ill and those with immune system disorders. Anyone who has had salmonellosis may pass along the bacteria for several weeks after recovering, but salmonellosis is seldom fatal. While the risk of getting salmonellosis is very small, there’s no need to take chances because cooking kills Salmonella. Are eggs the only source of Salmonella bacteria? No. Salmonella bacteria are widely found in nature and easily spread. The bacteria can be found in the intestinal tracts of animals, birds, reptiles, insects and people. While the egg itself may not be contaminated when you buy it, it can become contaminated from various sources, such as hands, pets, other foods and kitchen equipment, too. Is the risk of salmonellosis from eggs increasing? No. Salmonellosis incidents related to eggs have decreased markedly since 1990. From 1996 through 1999, the Centers for Disease Control and Prevention (CDC) and FoodNet (a food-safety surveillance system operated by CDC and other agencies) have reported a decline in disease from Se of 48%. The fact that there are fewer cases of egg-related salmonellosis is considered to be the result of on-farm quality-control programs, refrigeration during transport and storage, and food-safety education for home and food service food preparers. Can you eat eggs with blood spots? Eggs with a visible blood spot on the yolk are safe for consumption. The spot can be removed with the tip of a knife. Blood or “meat” spots are occasionally found on an egg yolk. These tiny spots are not harmful and are caused by the rupture of a blood vessel during formation of the egg. Blood spots do not indicate a fertilized egg. Mass candling methods reveal most blood spots and those eggs are removed, but even with electronic spotters, it is impossible to catch all of them. If desired, the spot can be removed with the tip of a clean knife prior to cooking. These eggs are safe to eat. How can I tell if my eggs have spoiled? The faster you use your eggs, the less time any potential bacteria will have to multiply. However, when properly handled and stored, eggs rarely spoil. Instead, as an egg ages, the white becomes thinner, the yolk becomes flatter and the yolk membrane weakens. 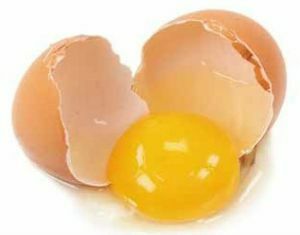 Although these changes may affect appearance, they don’t indicate spoilage and don’t have any great effect on the nutritional quality of the egg or its functions in recipes. Rather than spoiling, if you keep eggs long enough, they’re more likely to simply dry up – especially if they’re stored in a moisture-robbing, frost-free refrigerator. But, like all natural organic matter, eggs can eventually spoil through the action of spoilage organisms. Although they’re unpleasant, spoilage organisms don’t cause food borne illness. The bacteria Streptococcus, Staphylococcus, Micrococcus and Bacillus may be found on egg shell surfaces because all these species can tolerate dry conditions. As the egg ages, though, these bacteria decline and are replaced by spoilage bacteria, such as coliform and Flavobacterium, but the most common are several types of Pseudomonas. Pseudomonas can grow at temperatures just above refrigeration and below room temperatures and, if they’re present in large numbers, may give eggs a sour or fruity odor and a blue-green coloring. Although it is more likely for bacteria to cause spoilage during storage, mold growth can occur under very humid storage conditions or if eggs are washed in dirty water. Molds such as Penicillum, Alternaria and Rhizopus may be visible as spots on the shell and can penetrate the shell to reach the egg. Discard any eggs with shells – or, for hard-cooked eggs, egg white surfaces – that don’t look or feel clean, normally colored and dry. A slimy feel can indicate bacterial growth and, regardless of color, powdery spots that come off on your hand may indicate mold. Cooking Whole Eggs for Use in Recipes – As a nutritious combination of egg whites and yolks, whole eggs should be fully cooked for assured safety in recipes that call for raw or lightly cooked eggs. The following method can be used with any number of eggs and works for a variety of recipes. In a heavy saucepan, stir together the eggs and either sugar, water or other liquid from the recipe (at least 1/4 cup sugar, liquid or a combination per egg). Cook over low heat, stirring constantly, until the egg mixture coats a metal spoon with a thin film or reaches 160° F. Immediately place the saucepan in ice water and stir until the egg mixture is cool. Proceed with the recipe. Cooking Egg Yolks for Use in Recipes – Because egg yolks are a fine growth medium for bacteria, cook them for use in mayonnaise, Hollandaise sauce, Caesar salad dressing, chilled souffles, chiffons, mousses, and other recipes calling for raw egg yolks. The following method can be used with any number of yolks. In a heavy saucepan, stir together the egg yolks and liquid from the recipe (at least 2 tablespoons liquid per yolk). Cook over very low heat, stirring constantly, until the yolk mixture coats a metal spoon with a thin film, bubbles at the edges or reaches 160° F. Immediately place the saucepan in ice water and stir until the yolk mixture is cool. Proceed with the recipe. In a heavy saucepan, the top of a double boiler or a metal bowl placed over water in a saucepan, stir together the egg whites and sugar from the recipe (at least 2 tablespoons sugar per white), water (1 teaspoon per white) and cream of tartar (1/8 teaspoon per each 2 whites). Cook over low heat or simmering water, beating constantly with a portable mixer at low speed, until the whites reach 160° F. Pour into a large bowl. Beat on high speed until the whites stand in soft peaks. Proceed with the recipe. Note that you must use sugar to keep the whites from coagulating too rapidly. Test with a thermometer as there is no visual clue to doneness. If you use an unlined aluminum saucepan, eliminate the cream of tartar or the two will react and create an unattractive gray meringue. Making an Italian meringue by adding hot sugar syrup to egg whites while beating them does not bring the egg whites to much above 125° F and is not recommended except for dishes that are further cooked. If, however, you bring the sugar syrup all the way to the hardball stage (250 to 266° F), the whites will reach a high enough temperature. You can use a sugar syrup at hardball stage for Divinity and similar recipes.